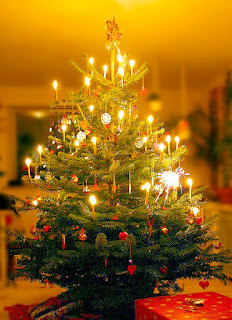 Danish Christmas tree with paper ornaments and real candles. One of the first historical short stories I wrote as a young aspiring writer (at least that I’m not embarrassed to think of now—my high school stories were so predictable! 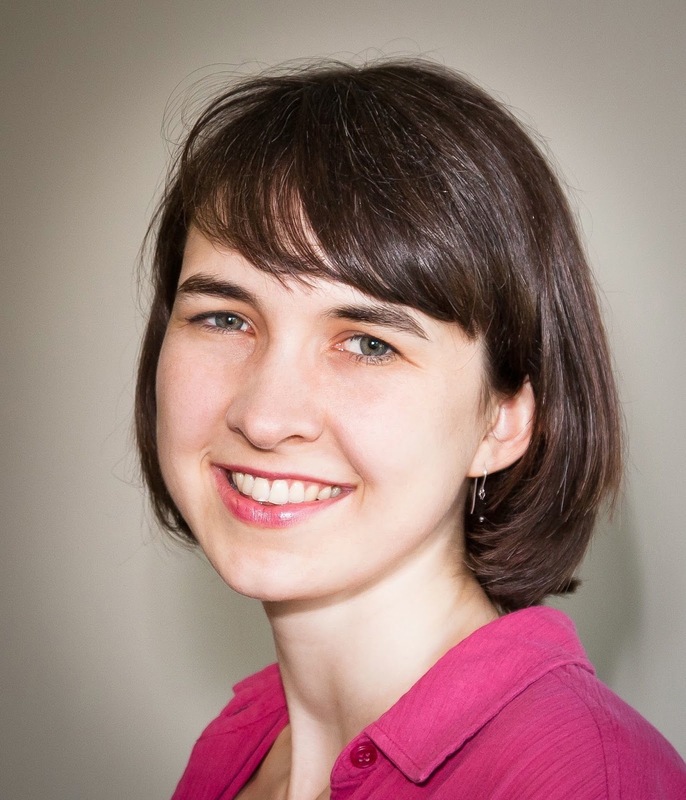 )—and my first to actually be published, if only in our hometown newspaper, was about a Danish immigrant girl in 19th century Minnesota who struggled with missing the Christmas traditions of her homeland. As my family has some Danish heritage, I loved learning about the beautiful Christmas traditions of Denmark in order to write that story, and I thought this month, as we enter the Christmas season, it would be fun to share some of them with you. Though I’m focusing here on historical traditions that have been around for a while, many of these still hold true in Denmark today. Denmark is a place that has preserved the Advent Wreath, traditionally made of real spruce and hung from the ceiling with red ribbons, rather than set on a table like Advent Wreaths often are in America. But the same tradition of lighting one candle each Sunday before Christmas applies. Furthermore, since the main Danish celebration of Christmas happens on Christmas Eve, the 23rd of December is traditionally a time for visiting friends before the main festivities begin. In Denmark, all God’s creatures are included in the celebration of Christ’s birth. On Christmas Eve, sheaves of oats or other grain are traditionally stuck in trees for the birds to enjoy, and other animals, wild and domestic, often get a special treat too. This partly comes from the legend of animals being able to talk on Christmas Eve. Danes love their Christmas tree, or Juletrae. Real trees are the rule, and even today real candles are often preferred over electric Christmas tree lights, just as they were in the 19th century. 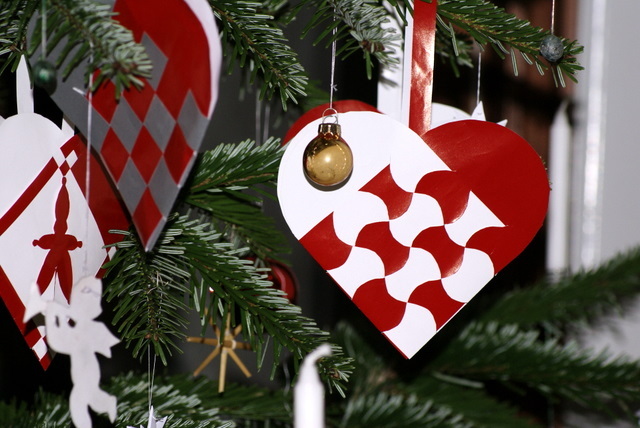 The Danish are known for their traditional papercraft, and most famous are the red and white woven paper hearts seen on Danish Christmas trees, as well as hanging on walls and elsewhere. The colors both signify Christmas and mimic the beloved Danish flag. I had fun making a Danish paper heart for our Christmas tree once—though the weaving is a little tricky, it’s very doable! Here's a link if you'd like to give the craft a try yourself: Making Danish Christmas Heart Baskets. 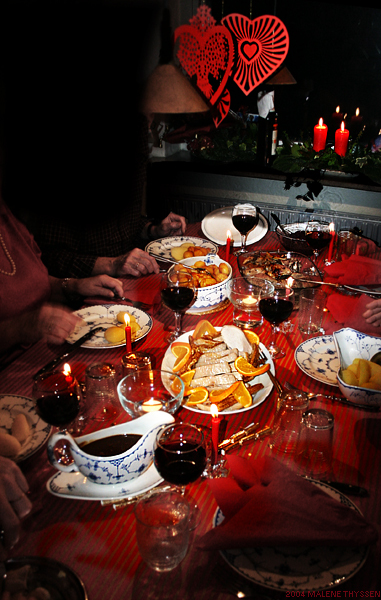 Of course, Christmas everywhere tends to be accompanied by delicious culinary traditions, and Denmark is no exception. The whole Christmas season is full of treats and home-baked goodies, like pebernodder, small traditional spice cookies. On Christmas Eve, families for generations have enjoyed a roast duck or goose stuffed with apples and prunes, accompanied by such delicacies as boiled, carmelized potatoes and pickled red cabbage. Dessert is a scrumptious cold rice pudding, or ris a l'amande, topped with hot cherry sauce. Traditionally an almond is hidden in the pudding for a lucky winner to find. Called Juleaften in Danish, Christmas Eve is the heart of this beloved celebration. After dinner, the family troops in to see the Christmas tree—which traditionally would not be set up until Christmas Eve. As everyone soaks in the wonder of the flickering candles, the family circles the tree singing Christmas carols and hymns together. And then, of course, time for presents! 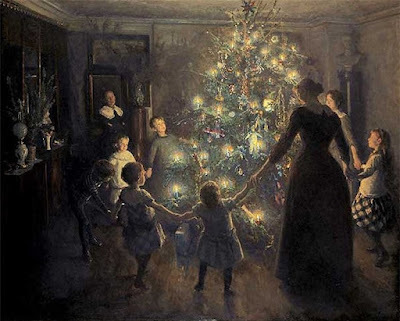 A 19th century Danish family circles the Juletrae on Christmas Eve. I hope you have enjoyed this little peek into the historical Christmas traditions of one little country in Europe: Denmark. Until the new year, I will now just wish you a Glaedelig Jul—Merry Christmas! One of my long-time friendships is with a Dane and although we're separated by years and miles, I felt her presence as I read your wonderful post. Thank you for starting off my day on this note. And now I think I'll go and write her a note as well. That's so sweet to hear, Anita! It's so special to have friends from other countries and cultures...they add such richness to our lives. Thank you for sharing about this precious friendship! Thanks for the peek into the Danish heritage and tradition! I wondered about the Christmas tree not being "seen" until Christmas Eve, how is that pulled off? Must be the children don't help decorate it? My grandma is Danish and we have always stuffed our Thanksgiving turkey with prunes and apples. We have made many of the woven hearts, too. How lovely to hear, Becky! Your Danish ancestry is much closer than mine...it was my great-great-grandparents who immigrated in the 1800s. Blessings!